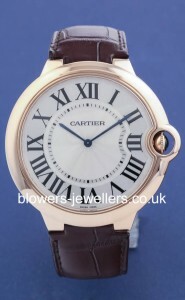 Released in 2007, the unmistakable Cartier Ballon Bleu is an elegant and balanced timepiece from Cartier. 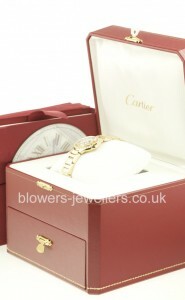 Its round shape makes it stand out from square Cartier watches such as the Tank and Santos. Some models are adorned with blue sapphire, and the dial set with diamonds. Like all Cartier watches, the Ballon Bleu features Roman numeral hour indexes. 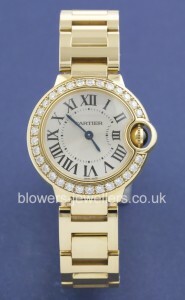 Blowers stock a variety of Cartier watches. All watches on our website are physically in stock at our Kingston upon Hull shop, and can also be viewed by appointment at our London office in Mayfair. Browse our current stock of Ballon Bleu watches below. Can’t find your specific model? Contact us and we will endeavour to source it for you.